The most recent book I finished from this list published by the Huffington Post is The Goldfinch by Donna Tartt. At nearly 800 pages, the book is by far the longest on the list, but also one of the best I have read. It follows Theo Decker through several tragedies in his life. We first meet him at age 13, living in New York with his mother, whom he adores. 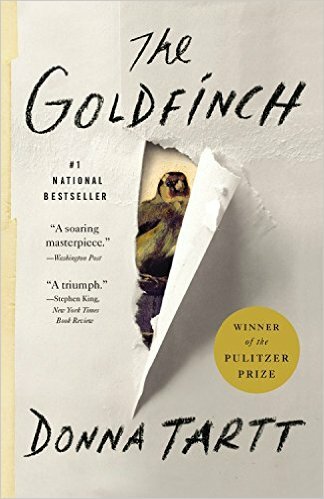 The Goldfinch won the Pulitzer Prize for Fiction in 2014. The story is tragic, and not at all uplifting, yet it is riveting. At first I was frustrated with the ending, but I realized that is because I was expecting a fairy tale ending and Tartt gives us reality. While reading the book I thought several times of Dickens’ Great Expectations, one of my favorite books. It turns out I wasn’t alone in getting a Dickens vibe from The Goldfinch. I discovered several reviews after finishing it that say the same thing. Do not be frightened of the number of pages (as I admit I was). This book is worth your time.